Day 1 started early for me as I wanted to get in early and make sure I got a full day out. So I arrived at the Bella Centre at 7:45 and got myself onto a hands on lab as it opened. The lab I took was Deploying ESXi hosts via auto deploy (not the official name but it’s close). The lab was really informative and I would highly recommend it as it gives you a great overview of how the whole auto deploy feature with vSphere 5 works and all the things you will need to do in your own environment to enable this feature. The lab also gave me a whole load of things to think about and start preparing to allow me implement auto deploy in my own environments. After the lab I made my way to the bloggers lounge to start writing up my All Things VMworld Day 0 posting and also chat to some of the vExpert bloggers. There’s nothing like sitting at the same table as Mike Laverick,Scott Lowe and Jason Boche to name but three and as I’ve said before, this for me is one of the biggest features of VMworld. After posting up my blog posting and having talked shop with a number of the fellow bloggers I made my way to my first session of the day "#CIM2363 Building an Enterprise Hybrid Cloud for Dummies: 10 Steps (or Less)" the session was good but obviously when they said for dummies they weren’t kidding as it was the real basics of vCloud director and what it’s all made up of. 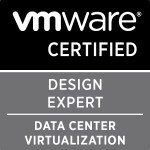 If you have never used vCloud Director and want to get a great overview of all the necessary components then I would highly recommend the session. Then it was lunch where I spotted the MonsterVM character wandering around and sat and chatted with the PowerCLI guru’s of Alan Renouf, Luc Dekens and Jonathan Medd over lunch. I then wandered back to the bloggers lounge and chatted to a few fellow bloggers about each of the sessions we’ve all been to and what we thought of them. I then went to Alan and Luc’s session "VMware vSphere PowerCLI Best Practices" The session was really good and the guys gave some really great tips on things to look out for and best practices. I hope they’ll upload their slidedeck as they had so many best practices (42 in total) that they couldn’t cover them all. The last announcement of the day was the VMware IT Business Management Suite. So far there doesn’t seem to be a large amount of information out about it apart from the VMware product page about it here. All three suites look amazing and it looks like VMware is definitely aiming to take some of the management market away from people such as vKernel and Xangati to name but two. One of the topics that was covered again like Vegas was Horizon Mobile and it looks like the deals are already growing as VMware have now signed deals with Verizon in the US and Telefonica in Europe to give their users the ability to have Horizon Mobile on their phones. After the keynote was the welcoming party with drinks and some snacks in the Solutions Exchange to allow everyone to speak to the exhibitors. I spoke to a few exhibitors but the two that had some interesting products which I may try out in my lab are vKernel’s vOperations Suite and Embotics’ V-Commander tool which I’m hoping will be helpful for creating baselines and understanding how things were provisioned and if I can claw back some resources in certain areas. I was then fortunate enough to attend the VMware vExpert 2011 meeting and meet loads of the European based (and a few Americans and Australians who also flew over) vExperts and talk about all the announcements and how we saw the market going and what it will mean for our roles. We then all made our ways to our respective parties and that was the end of Day 1 at VMworld Europe 2011. Categories: Virtualisation | Tags: All things VMworld, embotics, Horizon Mobile, vCenter Operations Management Suite 5.0, vFabric Application Management Suite, VMware, VMware IT Business Management Suite, VMware vExpert, VMware vSphere PowerCLI Best Practices, VMworld 2011, VMworld copenhagen | Permalink.